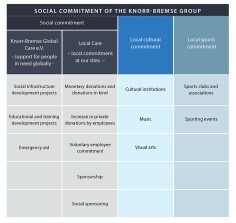 Knorr-Bremse has for many years been committed to supporting social, cultural and sporting activities around the world. Our social commitment is our response to both local and global challenges. The charitable organization Knorr-Bremse Global Care, funded by the Knorr-Bremse Group, provides financial support to people throughout the world who are in need through no fault of their own. The primary focus of the measures is on mid- to long-term educational and infrastructure projects. In addition, the organization provides emergency relief in the case of major disasters. 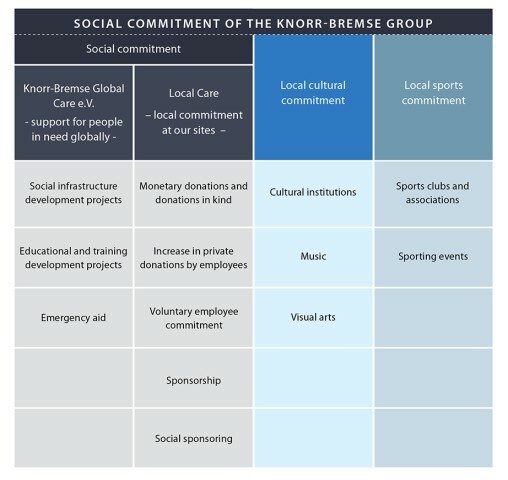 The activities of Knorr-Bremse Global Care are supplemented by projects at company locations – known as Local Care projects. These range from providing financial support for social institutions all the way to corporate volunteering projects in which individual employees participate on a voluntary basis. Apart from this, Knorr-Bremse also supports cultural and sports facilities such as museums and sports clubs as well as specific cultural and sporting events. You can find specific examples of our local commitments here under Local Care.